Croatia and Azerbaijan "have very good political relations without outstanding issues" and a lot of space for the development of relations, said Croatian President Kolinda Grabar-Kitarovic. The Croatian president, who is on official visit to Baku, made the remark after her meeting with Azerbaijani President Ilham Aliyev on October 24, the office of President Grabar-Kitarovic reported. During the meeting, the two presidents agreed that Croatia and Azerbaijan are friendly countries and strategic partners with very good relations and with no open issues and for this reason have plenty of room for better cooperation in many areas. "In Croatia, you will have a friend who will give you support in the relations with the EU,” the Croatian president said. 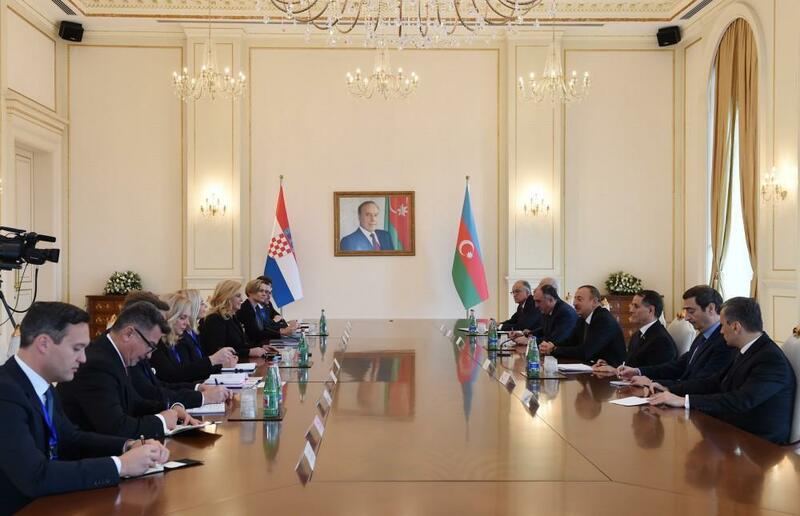 The Azerbaijani leader said that Croatia can improve its cooperation with Azerbaijan in the fields of trade, shipbuilding, transportation, agriculture, tourism and the very important Southern Gas Corridor Project. President Grabar-Kitarovic added that there was "room for improvement, expansion and deepening of cooperation" in economic exchanges, investment, trade, shipbuilding - especially when it comes to small boats which could contribute to security in the Caspian Sea. She also mentioned construction, agriculture, food production, pharmaceutical industry and the IT sector, as well as, culture, education, defense and security. Considering all of these possibilities for cooperation, the Croatian president expressed satisfaction with the Azerbaijani-Croatian Business Forum scheduled for October 24. During the meeting, the presidents discussed bilateral and regional relations and security issues, and President Aliyev informed the Croatian president on the state of negotiations over the Nagorno-Karabakh conflict resolution. The President of Croatia said that official stance of Zagreb was clear: "We support the territorial integrity of Azerbaijan and we believe that the solution to this conflict must be peaceful and political". The Croatian president arrived in Azerbaijan on an official visit on October 23. In Baku, President Grabar-Kitarović already held talks with Azerbaijani counterpart Ilham Aliyev and PM Artur Rasizade , as well as visited the Alley of Honors and the Alley of Martyrs.